The Morgan collection from American Leather features a number of plush sofas, soft reclining chairs, and a number of versatile sectionals. Each of these pieces has top-grain leather, all hard-wood frames, and a lifetime warranty on frame & suspension. Double-doweled joints with full-length corner blocks, loose back cushions, and loose seat cushions made of down complete this extremely comfortable upholstery collection. Optional wood legs in black, natural or walnut finish available. Eight-way hand-tied suspension also available. For a more traditional look, add optional brass tacks for nail-head detailing. This exquisite sofa features rolled arms and beautiful exposed wood legs. Sink into this wonderful, cozy, and relaxing sofa. Mix and match with any of the other pieces available to bring this beautiful traditional leather piece into your home. Leather Sofa Seat Width: 76"
Leather Sofa Seat Depth: 25"
Leather Sofa Seat Height: 19"
Leather Sofa Arm Height: 25"
The Morgan Morgan Leather Sofa by American Leather at AHFA in the area. Product availability may vary. Contact us for the most current availability on this product. 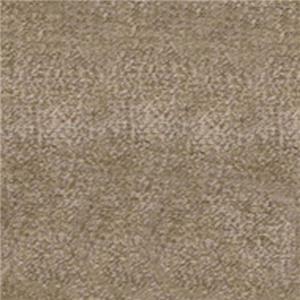 Fabric Options Leather, Ultrasuede. Available in a wide array of colors. Frame Construction All Frames are composed of a durable hardwood and double-doweled joints with full-length corner blocks. Seat Support Optional Eight Way Suspension features single coil springs that are attached with links and then “hand tied” to each other and the frame to achieve superior elasticity in the seat. Padding & Ergonomics Unidirectional webbing for support in high-density, high-resiliency urethane foam cushions. This collection features Feather Down Cushions. Warranty Lifetime Frame and Suspension Warranty. Furniture guaranteed to be free of defects for five years (does not include frame and suspension). Optional wood legs in black, natural or walnut finish available. Eight-way hand-tied suspension also available. For a more traditional look, add optional brass tacks for nail-head detailing. With a large selection of colors, suede, and leather fabrics, matching your decor was never more exciting. This collection features rolled arms and beautiful exposed wood legs. Sink into these wonderful, cozy, and relaxing sectionals. See the rich finish on the exposed wood legs. 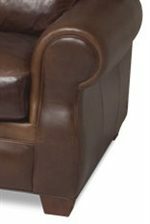 Imagine smelling the sharp, new leather and feeling the soft cushions in this gorgeous chair. Imagine running your fingertips along the fine welt detailing. Mix and match with any of the other pieces available to bring this beautiful traditional leather piece into your home. Perfect for any fine living room, family room, or entertainment area. Rolled Arms and Exposed Wood Feet. Optional Nail Head Detailing Available.